Copperloy’s lineup of high-strength aluminum yard ramps is ideal for heavy equipment, such as sound equipment, furniture or electronics. Our ramps can handle nearly any unique need, and are available in a variety of sizes, styles and capacities. Designed for dollies and carts, the aluminum and steel yard ramps that Copperloy offers for sale feature shark-tooth decking for a safe, non-slip surface. Our aluminum and steel ramps can also be custom-made, with lengths available to 16 feet and capacities to 4,000 lbs. (U.S. Patent #200688.) No matter where you’re going or what your loading, let the high-quality aluminum yard ramps from Copperloy help you get the job done more effectively. Why should I choose an aluminum ramp? If you’re moving heavy equipment, such as sound equipment, furniture or electronics, aluminum ramps provide the durability and flexibility you need to handle items of all weights and sizes. Our specialty ramps feature shark-tooth, non-slip decking and can be custom made. What Types Of Aluminum Ramps Do You Have Available? 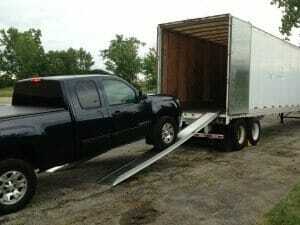 Stage/Van Ramps – Easily load and unload sound equipment for concerts and theaters. Twin Lock Ramps – Space ramps farther apart or lock them together depending on truck size and application. 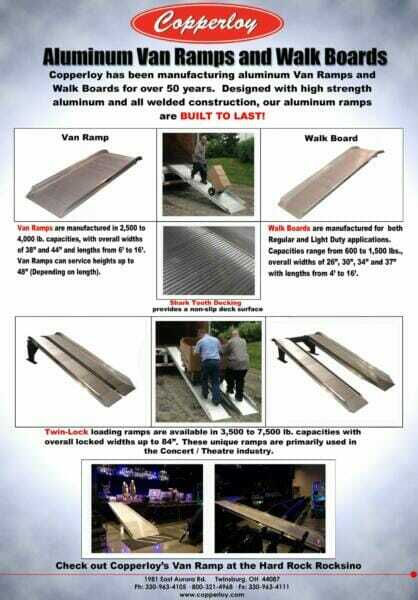 Walkboard Ramps – Durable aluminum ramps for a variety of moving applications. 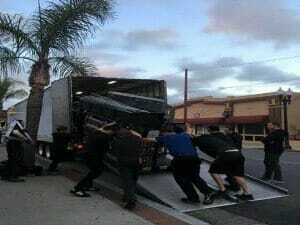 Watch the specialty ramps video below to learn more. Van ramps are manufactured in 2,500 to 4,000 lb. capacities, with overall widths of 38″ and 44″ and lengths from 6′ to 16′. Van ramps can service heights up to 48″ (Depending on length). Split loading ramps are available in 6,000 and 7,500-lb. capacities per pair with overall locked widths up to 38″. Stage ramps offer a versatile and convenient solution for usage in the concert and theatre industry. Quickly load and unload heavy equipment, sound and electrical gear, speakers and more. Make setup a breeze and cut down on the stress, time and physical labor of setting up for shows and performances.